Time to create new history : History has not been written by capital alone. The dynamics of capitalism is an expression of unplanned antagonism between labour and capital. The neoliberal milieu sometimes make us believe that it is the whims and fancies of the capitalist class that go unchallenged and hence capital can make the world of its own image. It had never been so and would not be in the future as well. Discourses that perceive capitalist logic as identical to that of human civilization is ideologically loaded. However capitalism has so far succeeded in imposing a facade of naturality over the rule of exploitation. This is precisely the reason why fall in stock prices has been of so much concern to people who matters whereas sharp decline in the share of wages during periods of high growthremains consciously unnoticed in a society that is increasingly becoming insensitive to the cause of labour. This is the moment of strike, a moment of political intervention for the workers toraise their voice when silencing their claims has become the most important qualifier of a proactive government. The government's recent push towards labour reforms is nothing but a war against the working class meant to dismantle existing protective institutions and push workers' share further down in the name of flexibility in production. Think of country that aspires for world class physical infrastructure, smart cities, seamless movement of global finance and so on but maintains uncanny silence on the question of elevating the standard of living of the labouring population. Let us make one global comparison: the world average percentage of workers earning less than 2$ per day (PPP) is 28 while in case of India it is 59 per cent. Out of the total number of 472 million workers in India 436 million that is more than 92 per cent are workers who are not covered under labour laws or social security schemes. How can one justify the precarious nature of the labour market in India where the share of regular wages and salary earners out of total workforce is only 17.9 per cent? Incidence of poverty is very high for those who are employed. How ridiculous it is that 36 per cent of the casual workers, 24 per cent of the self-employed and 9 per cent of the regular workers in India earn an income which is less than the already very low poverty line. The labour reforms suggested would provide greater freedom for the employers to hire and fire and also to increase the share of casual and contracted workers within the workforce. Already in the organized manufacturing the share of contract workers has increased from 10 per cent in 1992-93 to 34 per cent in 2011-12. Within non-agricultural employment, more than 68 per cent of the workforce is in the informal sector which means theirwork is non-permanent casual and contract-based. But is this to attain higher flexibility as a response to fluctuating global demand? If that had been the case then only functional flexibility would have been proposed that requires flexibility in job structure and multi-tasking. Given the fact that this is also a means to increase control over the workforce nevertheless if we accept this for the sake of argument one would expect higher wages for contract workers compared to regular workers because wages in that case should factor in other benefits related to social security and so on that would not be paid as it is done for longer term employment. But this is not the case. Rather, a regular worker gets an average daily wage of Rs. 392 and casual worker's average wage is Rs. 143. Therefore the implicit benefit of casualisation that the employers derive in the name of flexibility is basically reducing wages to roughly one-third of what has to be paid to a person employed on regular basis. Are the workers in India really paid so much that they are eating out the profits of the capitalists? Certainly not, as the following data confirms. First of all the workers share in value added considering total emoluments has come down from 47 per cent in 1981-82 to 25 per cent in 2010-11. In the organized manufacturing considering only wages the fall is from 25.9 per cent to 9.9 per cent during the same period meaning for every 100 rupees worth of value created in the economy workers share in terms of wages is only 9.9 rupees.Secondly despite high growth in labour productivity during the second half of 2000s at about 6.4 per cent, the growth in real wages was only 1.4 per cent on an average. So workers are low paid not because their productivity is low, on the contrary given their growth in productivity they are paid less than what they deserve. Thirdly, employers are keen to replace workers by machines, because it is always easy to handle machines those are products of past labour or 'dead labour' than 'living labour' and also driven by the imperative of following technology standards in a globalized market. The outcome is obviously a rise in capital intensity and that has resulted in this astonishing fact that the cost of labour in total output in the organized manufacturing has come down to 2.17 per cent in 2012-13. Therefore not only production requires less number of workers but also workers are paid less. In view of the starvation wages being given, and in view of the increased work and productivity, the workers are justifiably demanding a better wage – Rs.15,000 per month. 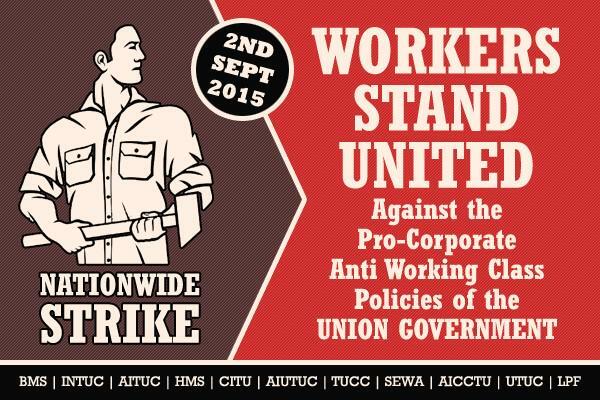 This is one of the key demands for which the 2 September 2015 strike is being organized. Bureaucrats at the Labour ministry have tried to mislead the workers through media planted stories that the Modi government is planning to raise the minimum wage. This was perhaps an attempt to puncture the growing support for the strike. However in no official forum, not even in the Labour Conference has this issue been addressed by the government. After all Modi has been ‘marketing’ India all over the world as a country with ‘cheap’ labour! Having experienced the wilful destruction of the labour law implementation machinery in the past two and a half decades, the refurbishing and strengthening of this machinery is also a key demand. Needless to say that the implementation of statutory minimum wages has always been a problem. 73 per cent of agricultural workers, 37 per cent of rural non-farm workers and 54 per cent of urban workers do not receive the stipulated minimum wages. But the implementation battle will be fought subsequently, in the streets if necessary. Histories are created in moments of crisis and the working class of our country need to rise on such occasions so that interventions can deflate future trajectories that are grossly anti-people.